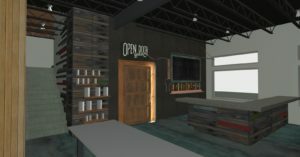 As a new brewery tap room was being built around the corner from us, we were approached by Open Door Brewing Co. to design the interior space for them. Their brand “Open Door” is reflective of their attitude of welcoming everyone to share a brew with them. 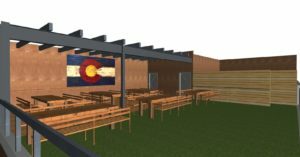 BAS1S created a funky vibe for them by incorporating old wood on the walls and to wrap the bar, separated by old door hinges, metal finish for their tap wall, and a custom windowed door awning to draw attention to their beer varieties. The custom cooler door was designed so the door looks perpetually open; with a bit of light poking through to beckon the curious. 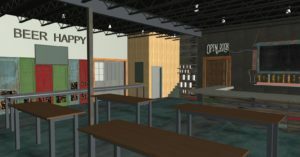 We also designed an illuminated sign for Open Door that would communicate different messages: Beer; Be Happy; Beer Happy. 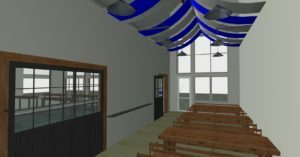 We are looking forward to see that sign in action!